Now, I could have just gone with TV characters to merely “have coffee with”, but that list gets real long, real fast! After thinking about it further, I realized I at least want to sit across the booth at a diner with someone who enjoys a good cup of java, characters who know their joe, people I’d like to have a cup, or two, or 100 with. Within that framework, it was much simpler to narrow down the list to the five candidates below. 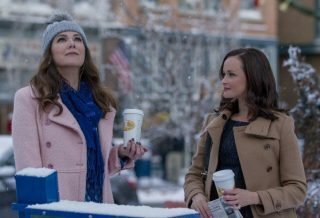 They come from shows such as the Gilmore Girls, NCIS, The West Wing and Futurama, which upon first glance, is quite the variety of shows. The characters all have one thing in common though… A sincere love of the Java. For most of them, it’s what gets them going in the morning. So, if all goes well, maybe, just maybe, they’ll let me buy them a cup or two. Much like myself, they both function on coffee. So much so, that often times the show itself seems like an lovers ode to the mighty caffeine bean. They love any coffee, not just Luke’s, any cup that gets them going. The real joy of having a cup or two with either of them is that they’re both well versed within popular culture, especially older movies, and I think I can hold up well with that type of chatter. 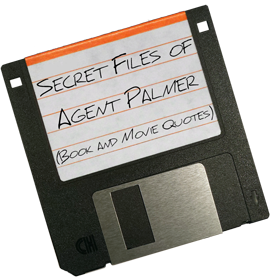 Which isn’t to say we’d only talk about movies, but it’s a starting point. Now the drawback here is that, as much as I am a coffee drinker, I still don’t think I’m in their league. So, I’d probably have to pace myself or be wired for an entire week, just for trying to keep up, cup for cup, with them. 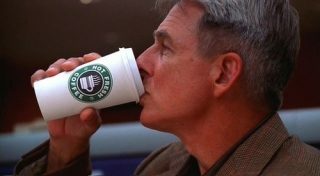 NCIS’s Gibbs, doesn’t just enjoy coffee, it seems more like a daily requirement. You know, like oxygen. As one of the “best interrogators in law enforcement,” the stories and skills he could pass on over one cup of coffee seems like a great way to spend a mid-afternoon. He’s also not so high on modern technology, preferring old school techniques, so I’m sure an “angry old man rant” couldn’t be too far from the first sip. For all his complexities, he’s a simple man when you get down to it. When Kate spills his coffee, she asks him “What do you put in your coffee?” to which he simply replies “Coffee.” No flavors, no frills, just coffee… That is Gibbs. I’m sure that he’s not a guy to “press” for anything, but if he’s in a good mood, the stories he could tell would be worth paying for the first three cups. Who wouldn’t want to sit down and have a cup of coffee with one of the most enigmatic female characters from The West Wing. She’s smart, she’s funny, she’s beautiful, she doesn’t take anything from anyone, and she could probably hurt you… Coffee with a side of danger, I guess? Though she is the on-again-off-again love interest with one of my favorite characters on the show, Josh, I would not being going into this “date” as it were with any romantic notions. I just want to pick her brain on political strategy and marketing, things she is exquisitely skilled at. Back in college, I used to dabble in politics, which is probably how it is for everyone, so I’d like to think I wouldn’t get completely schooled, although I’d be alright with that, too. Learning is never a bad thing. Futurama’s Fry loves his coffee… So much so, that in Season 4 Episode 5 “Three Hundred Big Boys” Fry takes his surplus refund and decides to buy 100 cups of coffee. And he successfully drinks the all, which, after downing cup number 100, time slows down for him, as I’m sure it would for all of us. I’m sure we’d all like to achieve that state of higher existence thanks to caffeine, and on a smaller daily scale, I’m sure we all do. That, along with being a 21st century person in the 30th century means that he’d have some stories to tell. Oh, you remember Brak, right? From Space Ghost Coast 2 Coast, and of course, The Brak Show? Well, this guy is not a coffee lover. However, despite the fact that he “doesn’t like coffee” because “it makes me jittery,” (or maybe because of this) Brak is one of the few people who would be annoying and yet fun hyped up on coffee. What fictional coffee junkies from the small screen would you like to have a cup with?